Arctic Securities Rapid Chess: Hammer lets Carlsen escape! The Arctic Securities Rapid Chess began on Saturday in the Norwegian city of Kristiansund. It features World No. 1 Magnus Carlsen, World Champion Viswanathan Anand, World's No. 1 rated woman player Judith Polgar and Norway's No. 2 player Jon Ludvig Hammer. Here is the schedule with times in CET. Standings after first section of the tournament. Anand beat Polgar and Hammer but drew with Carlsen. 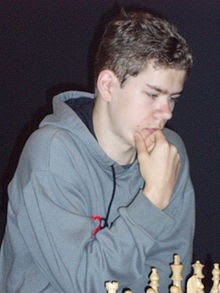 Carlsen also beat Polgar and Hammer but drew with Anand. Polgar and Hammer drew their games. Here is the website for more details and here is the link for live broadcast of the games. Meanwhile, Hammer is going to hate himself for quite some time for this blunder against Carlsen. Here is the nice game. You can run it in our pgnplayer or watch in flash below. Don't miss the 39th move by Hammer where he went Rhd2!